Why the UK Election May Send a Potent Message to the US in the 2016 Race for the White House. 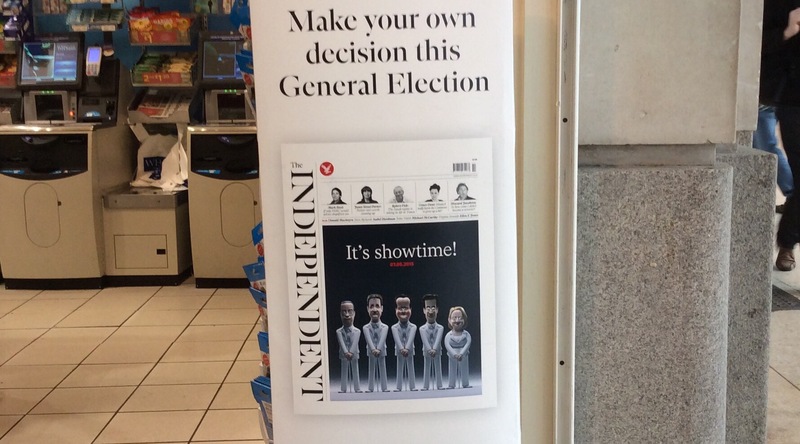 An ad for “The Independent” at a London newsstand. The warnings are everywhere. Britain could plunge into political uncertainty after this election with no clear roadmap for what happens next. But what is all the arguing about? The surprising thing for Americans is the issues here are very similar to the hot arguments in the U.S.
Conservatives are for cutting government deficits, welfare reform and passing a “no new taxes” law. The left-leaning Labor party wants higher taxes on the rich, more regulation of big business, and extra spending on health services and daycare for young children. Sound familiar? The last opinion polls before the election suggested the two main parties would get roughly 33% of the vote each, with the centrist Liberal Democrats, Scottish Nationalists, UKIP and Greens fighting over the remaining third. Hardly a recipe for strong government. What’s surprising to me is that while British voters believe David Cameron’s Conservatives are better at managing the economy, he is not way out in front. While Cameron has a stronger job approval rating than Labor’s Ed Miliband, the race has been very close. This suggests that the current government’s record of economic growth, creating more jobs, and cutting the deficit is not enough. As in America, voters here are profoundly worried about the decline of the middle class, and growing inequality between the rich and the rest. While UK unemployment has dropped, and education standards have improved in the past five years, the parties of the left (Labor, the SNP and the Greens) skillfully exploited class resentments and the widespread concern that globalization and technological change are more of a threat than an opportunity. If it forms a government Labor may be damaging to financial markets, entrepreneurs and wealth creation. But the fairness issue is front and center in this election. This vote is about values as much as it is a referendum on competence. The same could be true next year when U.S. voters pick a new President. ← The Scary Thing About Britain’s Election: No one Has a Clue What Will Happen.